The Red Square, Stalin’s “Seven Sisters”, the Moscow River – all of these are amazing sites to behold on the ground. But some argue that they’re even more breathtaking from above and what better way to enjoy them with a delicious meal and a nice drink in hand? Here we present some of the best rooftop restaurants with the most spectacular views. Though this one requires you to get out your fanciest shoes and dish out quite a hefty sum, the evening view over the brightly lit New Arbat, Moscow City and basically all of central Moscow is worth it. Thanks to these views from the 21st floor of Lotte Plaza together with the provocative darkness, the chic atmosphere and the sensual music it’s the perfect place for a romantic dinner all year around although, of course, the open-air summer terrace is by far the most spectacular. Not to mention that the food and cocktail menus are extensive and delicious. This cozy little Mediterranean style terrace on the top floor of Moscow’s main synagogue offers a very romantic view over the uneven rooftops of houses in the Pushkinskaya area and a comprehensive menu of Middle Eastern and Jewish fare. It’s at its best in the warm summer months as that’s when the outdoor bit is functional. Word of warning: Shabbat Shalom is taken seriously at Jerusalem so you will not be able to have your Friday night dinner or Saturday lunch here. White Rabbit is currently all the rage among Moscow’s trendy foodies, not least because it made it into the prestigious British hospitality industry trade journal “Restaurant Magazine’s” top 50 this year. Needless to say, the food here is phenomenal – one of the best in the capital at the moment. But what gives it that extra something? The view, of course. 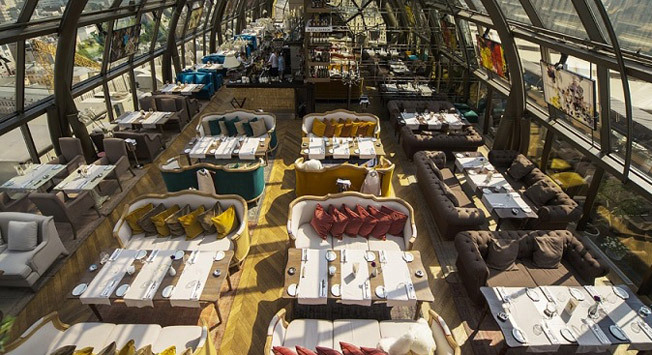 Overlooking Moscow from the 16th floor of Smolensky Passage, this restaurant that infuses its décor with themes from Alice in Wonderland essentially puts all of central Moscow right on the palm of your hand as you sit back and enjoy chef Vladimir Mukhin’s culinary master pieces. This Italian restaurant (with an Italian owner and chef) on Red October will serve you some of the finest and most authentic pasta, risottos, meat and seafood with the added bonus of an unparalleled view over the Moscow River and Cathedral of Christ the Savior. The only downside: the spacious rooftop terrace is open only during the summer so hurry up and go there before autumn arrives. One of the capital’s oldest and most beloved rooftop restaurants, Sky Lounge is located on the top floor of the Soviet futuristic Russian Academy of Sciences building just south west of the city center, which means one thing: marvelous 360 panorama views of the Moscow River, Moscow State University, Luzhniki Stadium and Moscow City. It’s not the cheapest place in town but for your hard-earned rubles you will get attentive staff, a high-energy upscale vibe and an internationally inspired menu from brand chef Artem Dobrovolsky. The views are gorgeous all year around but in the summer months you have the chance to sit outside and take in the views as the wind blows through your hair. Translated as “Happiness on the Roof”, this cute veranda is perfect for a group of girlfriends, a young family or a couple romantically looking into each other’s eyes whilst enjoying beautiful views of Pushkin Square. Many guests complimented the pastries and breakfasts as well as the price to quality ratio but noted that service was rather slow and reservations essential on weekends. This stylish hotel occupies one of Stalin’s “Seven Sisters” and is a beautiful site in itself but as the elevator starts taking you higher and higher, the views and dining options only get better and better. We’ll warn you straight away: these restaurants are very pricey. Designed by Russian restaurateur Arkady Novikov, Tatler Club Restaurant offers innovative cuisine and river views. In the warmer months, you can dine on the terrace for a delightful and memorable experience. For premier Italian dishes, try Buono Restaurant. Chef Christian Lorenzini masterfully prepares each meal with meticulous detail. The lovely terrace features a glass roof that lets natural light flow into the dining area. The Romantic Restaurant is located on the hotel’s top floor and serves delicious cuisine set against a stunning backdrop of panoramic Moscow views. Celebrate any special occasion, from an anniversary to engagement, at the restaurant, the ideal venue for a memorable dining experience. Decorated in a 1930s Manhattan style, the 31st-floor Mercedes Bar pours an array of creative cocktails constructed by expert mixologists. The views from this bar are unforgettable.